President Obama says the U.S. must balance its advocacy for human rights in Saudi Arabia with the need to cooperate with Saudi Arabia on counterterrorism and security. 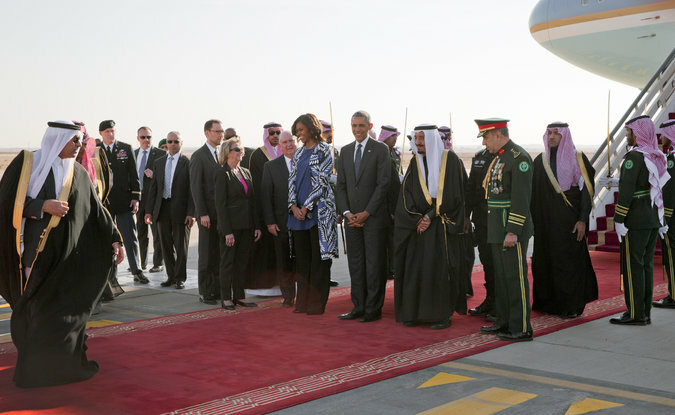 Mr. Obama arrived Tuesday in Saudi Arabia to pay respects to the royal family following King Abdullah's death. He said in a CNN interview before his arrival that it was most effective to apply "steady, consistent pressure" on Saudi Arabia over human rights, even as the U.S. works with the Saudis to get business done. Mr. Obama said that necessary balancing act sometimes makes U.S. allies uncomfortable. But he said that throughout the rest of his presidency, he'll keep arguing to U.S. partners like Saudi Arabia that they must pursue reforms in order to survive in the modern world. The U.S. leader's visit comes as Saudi blogger Raif Badawi awaits the rest of his 1,000 lashes -- the sentence handed down by a Saudi court for the crime of "insulting Islam" with his online musings. Earlier this month, Saudi authorities postponed the second round of public flogging after a doctor concluded that Badawi's wounds from the first 50 lashes had not healed, a leading human rights group said. Amnesty International said authorities delayed administering the next 50 lashes, which were set to take place after midday Friday prayers on Jan. 16. The group said Badawi was taken to a prison clinic in the morning for a check-up and that the doctor found that "he would not be able to withstand another round of lashes at this time." According to the group, the doctor recommended Badawi's flogging be postponed a week. At the time of Mr. Obama's arrival, Badawi had still not been subjected to the second set of 50 lashes. Badawi's first public flogging took place on Jan. 9 before dozens of people in the Red Sea city of Jiddah. The father of three was taken to a public square, his feet and hands bound, and whipped 50 times on his back before being taken back to prison. His wife and children escaped Saudi Arabia to Canada, where they continue to issue calls for his released. Saudi Arabia is often labeled as the most conservative Muslim nation on the planet. It is home to the Wahabi or Salafist sect of Sunni Islam, to which most of the radical Islamic terror groups being fought by the U.S. and its global partners claim adherence. CBS News correspondent Holly Williams was granted rare access to the kingdom late in 2014, and found that while the hundreds-of-years-old traditions which still govern society there --banning women from driving and seeing convicts beheaded publicly -- remain firmly in place, there are undeniable signs that change is coming. Williams met female members of the Saudi legislative body who are pushing for democratic reforms, but admitted themselves that the pace of such change was essential to get right, at the risk of dramatic upheaval in yet another nation at the heart of the tumultuous Middle East. Saudi Arabia's late King Abduallah was credited with bringing a small degree of reform to the nation, and his successor, King Salman, is widely expected to carry on in that direction -- at the same glacial pace.